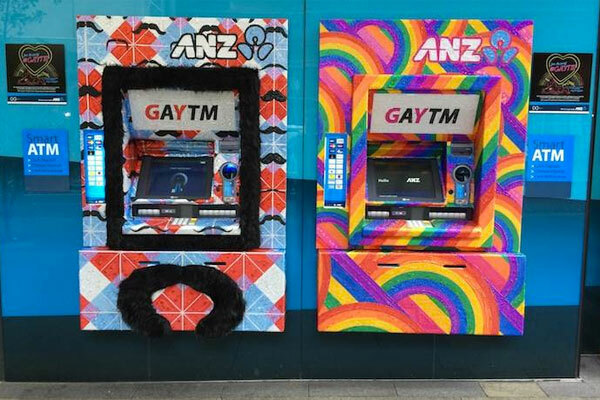 CASE STUDY: Working with Whybin/TBWA Group Melbourne, Australian bank ANZ generated massive media coverage after decorating 10 of its Sydney ATMs with rhinestones, sequins, studs, leather, denim and fur. The work described here won a Gold Spike in the PR category at Spikes Asia. ANZ Bank, is one of Australia’s largest financial institutions. As a company ANZ believes in diversity, inclusion and equality in their workplace. To promote these beliefs beyond the company walls, ANZ has been a major sponsor of the Sydney Gay and Lesbian Mardi Gras (one of the world’s largest gay rights marches) since 2007. In 2014 they became Principal Partner. The objective was widespread public understanding of ANZ’s support and partnership with Mardi Gras. At the onset of the campaign, a successful outcome was deemed to be: 22 million media impressions (or opportunities to see); Sydney metro newspaper coverage; and news coverage on at least one major commercial TV channel. Currently in Australia, public perception of ‘the big four’ major banks is quite low—as banks are often perceived by the Australian public to be cold, callous organisations placing profits above people. They are also viewed as very conservative and incredibly ‘corporate’ institutions. The agency transformed central Sydney ATMs into dazzling GAYTMs. Ten unique GAYTMs, inspired by gay and lesbian culture, were installed on Sydney’s busiest streets for three weeks surrounding the Mardi Gras. Bejewelled by hand in rhinestones, sequins, studs, leather, denim and fur, each GAYTM was a riot of colour and textures to celebrate the festival and show ANZ’s support for diversity. The display screens on the GAYTMs were changed to carry messages such as ‘Hello gorgeous’ and ‘Happy Mardi Gras!’. The GAYTMs also dispensed rainbow coloured receipts with the message ‘Cash out and proud’. And during the campaign, ANZ donated all GAYTM operator fees to non-profit gay and Lesbian charity organisation, Twenty10. The creation, installation, and delighted public reactions to the GAYTMs became short webfilms. Content was then uploaded to Instagram, YouTube, Flickr, Twitter and Facebook. Knowing that the greatest success with Australian news media would come from a surprise reveal of the GAYTMs and reaction from the public, the designs were kept under tight wraps. The agency performed installation in the dead of night and took its own photography and film at first light on a Sunday morning whilst Sydney was still asleep. A business interview with the designers and ANZ spokesperson had been arranged with Channel 9 and the Australian Financial Review to run that morning and as soon as it was on air, the agency started calling media. An ANZ Business Systems Analyst, who happens to be a drag queen, dressed in full costume and hosted media in front of the GAYTMs, while TV and online media interviewed passersby for their reaction. From there the coverage grew and grew.